One Amish community in a northerly part of the state of New York is finding modern building regulations are encroaching on its way of life. In June 2007, St Lawrence County's assistant public defender, Steve Ballan, got a call from his boss. A bunch of Amish men are in trouble, he was told. They need a lawyer. Although the Amish had moved up to this remote part of northern New York State 30 years earlier, they had kept themselves to themselves and Mr Ballan had had little to do with them. But when he met with Andy Miller and the five other Amish men charged with contravening state building codes, he was certain that the town's building inspectors had violated America's first and greatest constitutional amendment - the right to worship freely. What had provoked the inspectors to issue Stop Work Orders was the Amish men's refusal to install smoke alarms in their newly built houses. In court and in broken English - their first language remains a German dialect - Andy Miller explained that it would be against their Christian beliefs to have something so modern in their homes. It did not wash with the judge. Miller and the other Amish men were fined. They refused to pay - pointing out that that would imply they had accepted that obeying God's laws was wrong - and how could God be wrong? Mr Ballan persuaded the judge to stay the case and contacted a religious liberty law firm that has taken it to federal court, where now it sits waiting to be heard. The 250,000 Amish in the US have been making accommodations with modernity ever since the industrial revolution - when our life and Amish life parted company forever. But in this rather drab corner of New York state, compromises are unacceptable. That is because the Amish up here are a small and deeply conservative sect called the Swartzentrubers who came to the wilds of the North Country to lead a life separate from the evils of the 21st Century - one that reflects the Amish mantra of "being in this world but not of this world". But, it seems being as far north as it is possible to go before you hit Canada is not enough for the Swartzentrubers. Recently, their church elders attempted to separate themselves still further. Swartzentruber dairy farmers must now transport their milk to a central collecting point so their families avoid contact with the lorry driver. Last year their children were barred from entering Canton, the local town - for fear of being corrupted. It is true, Canton is home to a university campus but it is a private college, tucked away on private land. There is not much action on a damp Thursday night in this part of the world. And two years ago the Swartzentrubers fought the local authorities over their refusal to fix orange hazard triangles on the back of their traditional horse-drawn buggies. In other states the Amish had accepted the move as a sensible safety measure but the Swartzentrubers saw the triangles as an ungodly and garish adornment. Their stubbornness paid off - Swartzentruber buggies remain triangle-free. And now there is the bickering over smoke alarms. I met one of the rebels, Mose Miller. He is short and squirrelly with a raggedy red beard. We talked at his doorstep with his nine children looking on. It was cold: -15C (5F). Most of the kids were in bare feet. Their clothes were roughly sewed together - like Victorian patchwork puppets. Their hands and faces were grimy with dirt from the farmyard. Lizzie, his eldest daughter, showed me round their home. There were two bedrooms for the children - wooden pallets and old blankets served as beds. They hand-pumped water for washing, and there was an outdoor privy. The fire they cooked on prompted me to ask Mose about the smoke alarms. "I use this," he said pointing at his nose, "or him," and his finger pointed upwards. "I don't need a devil on the wall to tell me if my house is burning." I asked him what would happen if he did not wake up and all his children were burned to death. "If God does not wake us, well, that must be part of his plan," Mose told me. His eyes twinkled as he spoke and I had an overriding feeling that Steve Ballan, the lawyer, was on to something. Thirty years ago no-one had smoke alarms. We changed, not the Amish. The chances are Mose and his recalcitrant friends will win their battle - they usually do. Less clear is how this 19th Century enclave will retain its unique identity. The North Country may be remote but there is a brisk trade in mobile phones among Amish teenagers - the internet and all the perils it presents for these deeply religious people are now ever-present. Perhaps, in the end, court cases and the internet do not really matter. As Mose politely led me back to my car, he turned to me. "We're just pilgrims and foreigners, just passing through," he said. "This life is just a speck in the sand, compared to eternity." 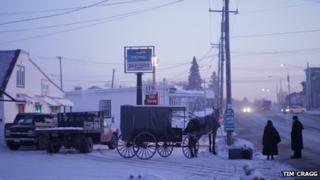 David Belton has made a documentary about the Amish for PBS. You can find out more at their website. Hear daily 10-minute editions Monday to Friday, repeated through the day, also available to listen online . Read more or explore the archive at the programme website .